With the notable exception of ExxonMobil, oil majors are leaving the Canadian oil sands sector. They are replaced by Canadian oil companies. An increasing number of important institutional investors shareholders shun carbon-intensive oil sands exposure as much as coal. Moreover, multi-decade oil sands projects are in contrast to a more flexible and more diversified investment approach which is the “strategy du jour” in board rooms these days. Short-term shale projects, diversification into gas, or even offshore wind, meet off-risk demands in a better way. The main problem, however, for all oil sands operators is logistics. The existing pipeline capacity to consumer areas is exhausted. Rail, barge and even truck transport are used but at a considerable cost and with limited capacity. When transport bottlenecks pressed most Canadian crude prices to just 13 $/b politics stepped in. Large Producers such as Canadian Natural Resources, Nexen Energy and Cenovus Energy, who lack access to own refineries, demanded from government a temporary cut in production. The push met opposition by Suncor Energy, Imperial Oil and Husky Energy. Their refineries generate enormous wind-fall profits thanks to low input prices. Now, a kind of “Mini Opec” forces Canadian operators to cut their production since the beginning of this year. Spreads have almost normalized. Canadian oil sands producers are counting on three proposals for new takeaway capacity to defuse transport problems: the 830,000 b/d Keystone XL pipeline, the 590,000 b/d Trans Mountain pipeline expansion to British Columbia, and a 370,000 b/d expansion of Enbridge’s Line 3 into the US Midwest. But there are major legal and political obstables for all three projects. The last major oil sand project was (Canadian) Suncor Energy´s Fort Hills project in 2013, which is now ramping up to full output. Independent Suncor Energy holds the top position in Canadian oil sands. In fact, it is already a “mini major”. 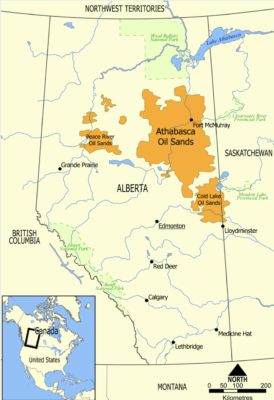 It currently has about 940,000 barrels a day of oil production capacity and a large refining business. Enterprise value is about US$80 billion. Canadian companies bet on an increase in efficiency, innovation and benign climate policies. Oil sand is still a very young industry. Operating costs at Suncor fell from over 30 US-Dollar per barrel in 2012 down to below 20 US-Dollar in 2017. They expect to get even below 15 US-Dollar per barrel oil in a few years time, thanks to autonomous oil sands trucks and digitalization of operations.